Thomas Hitzlsperger was on target on his West Ham debut as Avram Grant's side shrugged off their relegation worries to book a place in the quarter-finals of the FA Cup with a clinical hammering of Burnley. The German, who had been out for six months with a thigh injury, opened the scoring with a 25-yard thunderbolt before Carlton Cole scored twice in three second-half minutes to put the Hammers in the driving seat. The second of the England forward's strikes - a beautifully-taken half volley - was followed by Winston Reid's powerful header on the hour to make it 4-0. An error by Robert Green gave Jay Rodriguez a consolation for the Clarets, but Grant's team scored again through Freddie Sears in injury time to seal the emphatic win and set up a quarter-final clash with Stoke. For Grant, the match represented a chance to deflect attention from his side's lowly league position and make up in some part for his team's failure to make it to Wembley in the Carling Cup. The Israeli was boosted by Hitzlsperger's return and he also handed starts to Freddie Sears and James Tomkins, who came in for Achilles injury victim Matthew Upson. It had been reported that Upson would be out for the rest of the season but the Hammers captain allayed those fears by saying before kick-off that he expected to be back in training "very soon". 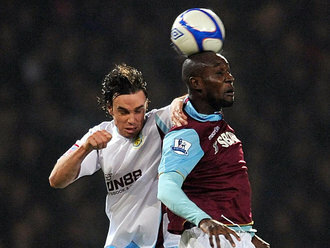 Burnley boss Eddie Howe brought in Wade Elliott for Chris Iwelumo. Cole, who scored the equaliser in West Ham's six-goal thriller at West Brom last week, threatened early, racing onto Demba Ba's through-ball but Lee Grant came out to pick up the ball just in time. Ross Wallace then whipped a beautiful ball over the top that set Rodriguez free. The England Under-21 man lifted the ball over the onrushing Green but Reid came to the stopper's rescue with a crucial clearance. Green quickly made amends by superbly tipping over Rodriguez's lob. The home crowd were beginning to get anxious as Burnley stroked the ball around the park with ease. Their nerves were settled, however, when Hitzlsperger charged at the away defence and paused before unleashing a blistering 25-yard strike that flew past Grant to give the Hammers the lead. Grant should have done more to keep it out but the midfielder did not care, running to the corner flag to celebrate with his team-mates. The Hammers looked settled by the opener but the visitors soon reminded the Premier League side of their attacking threat when Green saved well down to his right from Chris Eagles' 25-yard drive. Howe's team pressured the West Ham defence with a number of attempts as the half drew to a close but the Hammers defence stood strong, with Reid in particular doing well to stifle the pacy threat of Rodriguez. Burnley came out after the break looking for an early equaliser but they were shocked by Cole's two strikes in the first five minutes of the second period. Mark Noble threaded Cole through with a brilliant ball but the England striker dithered allowing Grant to come out attempt to dive for the ball. Cole was given a second chance though as the ball came spun free and the 27-year-old swung his leg out to somehow stab the ball home whilst still laying on the floor. Cole's first goal may have partly been down to luck, but there was nothing fortuitous about his second. Noble played a long raking ball over the stationary Clarets back four, Cole raced on and dispatched a beautiful half-volley into the top left-hand corner of Grant's goal to make it 3-0 with 55 minutes on the clock. Grant, who had remained sullen throughout the first half, afforded a smile as he watched his team look for a fourth goal and it soon came through Reid's just before the hour. The New Zealand defender rose to head home a six-yard header from Hitzlsperger's corner. Rodriguez was booked for a late challenge on Freddie Sears before Hitzlsperger departed to a rousing reception to be replaced by Pablo Barrera. The away side pulled one back 12 minutes later when Green's careless clearance hit Tyrone Mears on the head inside the six-yard box and the ball fell to Rodriguez who nodded home into an empty net. Cole was not given a chance to seal his hat-trick as he was replaced by Jonathan Spector with 15 minutes left. Grant then had to be at his best to tip over Ba's fizzing 25-yard volley 10 minutes from the end. That was the Senegalese's last contribution as he was replaced Frederic Piquionne with eight minutes remaining. The Frenchman ballooned a 30-yard effort over the Burnley goal near the death as the Hammers looked for a fifth. Reid then pulled off a fantastic goal-line clearance at the other end before Sears wrapped the win up with an 15-yard strike at the death. West Ham Green, Reid, Tomkins, Jacobsen, Bridge, Sears,Parker, Noble, Hitzlsperger (Barrera 67), Cole (Spector 73),Ba (Piquionne 82). Subs Not Used: Boffin, Boa Morte, da Costa, Hines. Goals: Hitzlsperger 23, Cole 48, 50, Reid 59, Sears 90. Burnley Grant, Mears, Duff, Carlisle, Fox, Elliott, Cork,Eagles (Thompson 84), Marney (Alexander 72),Wallace (Iwelumo 73), Rodriguez.